Fire up one of these innovative patio space heaters to keep your backyard toasty through the chilliest of nights. Warm your space with a patio heater that exudes romance as well as heat. 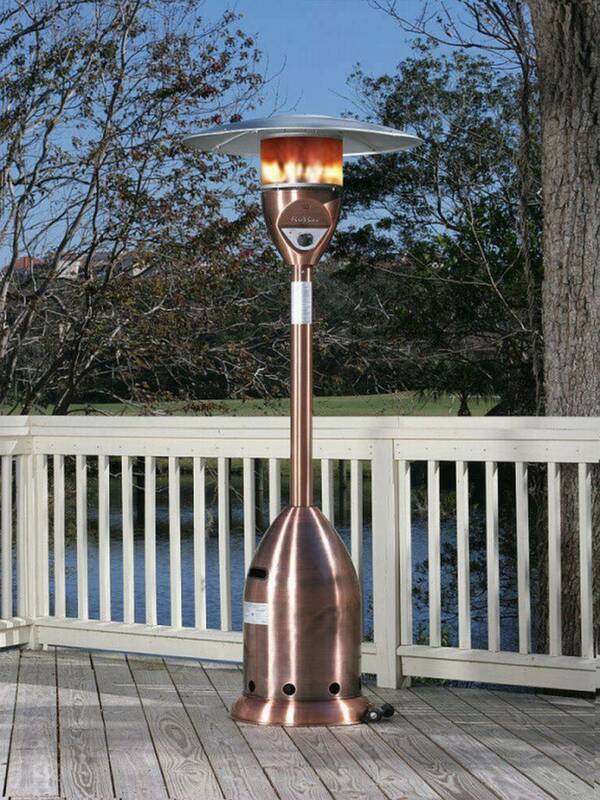 This heater's bonﬁre torch design reflects heat all the way up a column of ﬁre. The flame is enclosed in a glass tube that protects it from the wind and adds an extra layer of safety between you and the ﬁre. Available from The Home Depot; $295.28. Hang this electrically powered heater in an area where floor or table space is scarce or nonexistent. Less expensive than a propane heater, it runs on regular household electric current and is safe to use both indoors and out. Available from Target; $96.99. If the industrial look of a traditional propane heater doesn’t suit your style, try a slimmer version. This 1,500-watt halogen model runs on your household's electricity, and it looks more like a lamp than a bulky heater. Available from The Home Depot; $131.51. Don’t let the chill of evening drive your party indoors. A standing propane heater can provide up to a 9-foot radius of warmth on your deck or patio, or in your backyard. The anti-tip base conceals a propane tank, and the heater can be wheeled wherever you need it. Party on! Available from Target; $109.99. Keep seated guests comfortable with a tabletop propane heater. This model runs on the disposable propane cylinders used in camping equipment, which are easy to find and easy to install. Available from The Home Depot; $96.81. Stay warm in style while being environmentally conscious. GreenTech Environment's pureHeat patio heater utilizes carbon fiber infrared technology, a safer and more efficient choice than using oil, ceramic, or quartz bulb heaters. Keeping cozy (and clean) never looked so good. Available from The Home Depot; $149. Improve your cool-weather outdoor dining experience with a halogen tabletop heater that runs on household electricity, operates silently, and doesn't put out any toxic residue. The lack of harmful emissions means it’s safe for use indoors as well as out! Available from Target; $109.99. Let heat radiate from the rafters with a slim-bodied hanging heater. This 1,500-watt halogen model is equipped with electronic ignition for quick and effortless startup. It attaches to any standard umbrella pole, making it easy to integrate into any kind of yard that has a patio umbrella. Available from The Home Depot; $113.18.